A frozen Monday morning at -11°C and with a lot of wind from Russia was not the most comfortable situation in which to wait for a long time for something to happen. After two hours most of the fellow photographers in our hide packed up and moved to a warmer environment for a hot cup of tea or coffee. The lagoon is now completely frozen and covered in snow so that even the water birds make themselves very rare. The Red Fox (Vulpes vulpes) is an animal with a large habitat including forests and fields but also villages and even large cities where it is much easier to get food by scavenging rubbish dumps and dustbins. This specimen here lives in the forest close to the lake and comes out regularly to search for dead water birds or small rodents which fall victim to the severe cold that has been keeping Europe in its fierce grip for the last two weeks. Its beautiful thick winter fur protects it well against the low temperatures. On the other hand, food is not as freely available as it is closer to human presence. 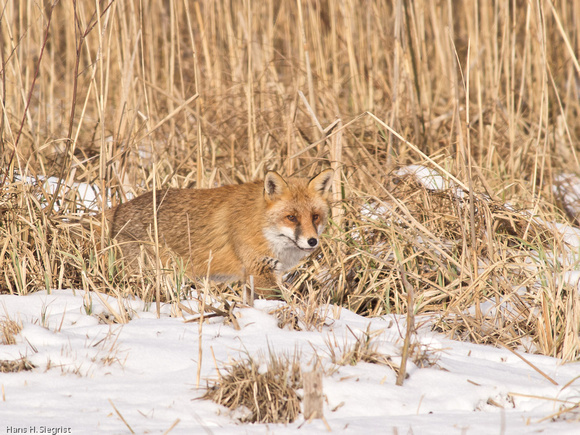 While red foxes in cities become almost oblivious to human presence, this one ran off immediately when it heard the shutter clicks, even from a distance of 50 metres. The whole series of about 25 frames resulted in four usable pictures of which this one was the most attractive.